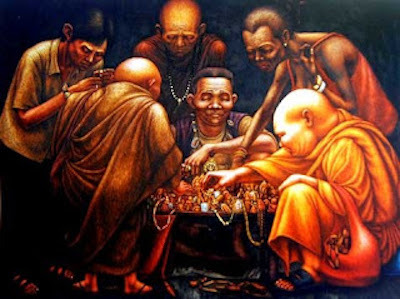 A painting by Withit Sembutr titled Doo Phra, depicting a group of Buddhist monks crowding around an amulet-seller, has been withdrawn from an exhibition in Bangkok. Withit, an art student, entered the painting in the Young Thai Artist 2007 competition, and the winning entries are currently on show at the Esplanade mall. There is, however, a blank space where Withit's painting should be. It was withdrawn due to controversy surrounding a painting by another artist, Anupong Chantorn, which is currently being exhibited at Silpakorn University in Bangkok (at the 53rd National Exhibition, until 30th October). Anupong's painting, Perceptless (which is on the cover of the exhibition catalogue), shows monks with beaks, presenting them as bird-like scavengers. 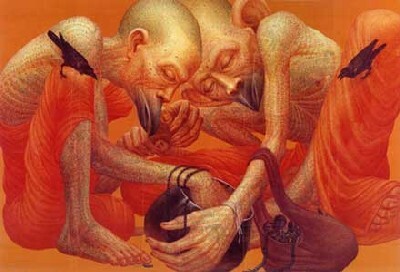 There have been demonstrations against the painting by Thai monks, though it has not been removed.